Hollywood loves a comeback, and few have been more welcome than Kermit the Frog’s return to the big screen in “The Muppets,” this year's big Thanksgiving release. As audiences, showbiz movers and shakers and maybe even Oscar (the gold guy, not the Grouch) pay close attention to the amphibian actor’s renewed high profile, Kermit talked with us (really, he sat down and talked to us) and reveals that maybe it’s a little easier bein’ green after all these years. Did you imagine that you'd be welcomed back with such open arms? Well, I think we have this sort of core fan base. We keep up with them on the Internet all the time. I expected those folks to welcome us back, but you never know about the rest of the world. Times have changed and people can get cynical. Who knows if The Muppets would've had a place, but it sounds like we do. This film is really true to the heart of what The Muppets have always been about. What did it mean to you to come back in that way and not sell out, in a sense? They swear this is final parody trailer for the upcoming film, but honestly, could watch a new every week. The film, starring Jason Segel and Amy Adams, opens Nov. 23. It's extremely important. I mean, our story in this film is about The Muppets having not been together for a long, long time. We all get back together. In fact, I think I stretched in my performance with this. I'm playing a Kermit the Frog that's very sad and down, but that's actually just the story. 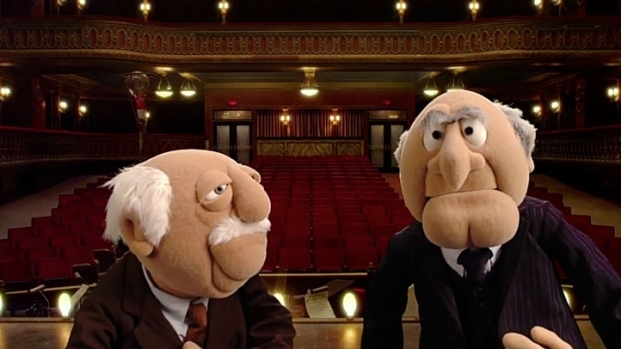 Us Muppets have been together for all these years and we do actually try to stay very true to who we are. I think that explains our whole connection to the audience. We sort of appeal to the frog and bear and pig and chicken in everybody. You're a huge star. Have you seen people get really nervous around you? I have, and it's kind of silly, really. I'm just a simple little frog. I don't really think of myself as being a big star. I know I've done lots of movies and stuff, but I'm pretty simple, really. I don't really get into the whole Hollywood lifestyle, and when I'm not working I just go back to the swamp. I'm just like everyone else. I'm just a guy from the swamp. I don't want people to be nervous. I get a little nervous around people sometimes, because I'm quite small and I have to watch where I step and watch where they step. 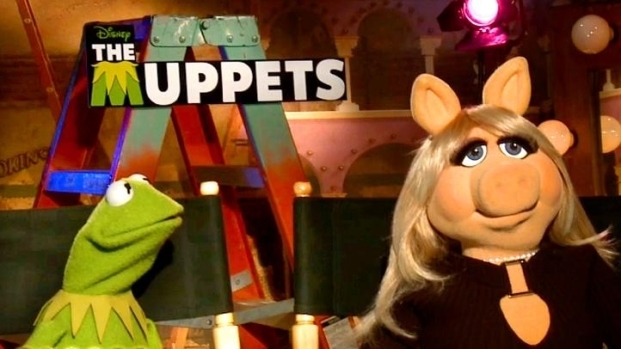 Kermit The Frog and Miss Piggy chat about making their big screen return in Disney's "The Muppets." What did they do to prepare for this movie? Plus, are Kermit and Miss Piggy currently an item? What's one of the biggest high points of your career that you remember? Wow – I've had a lot! I do have to say that as big of a thrill it is to be back in a big movie – that's one of them – but something I did a few years ago that was really cool was that I went to the Queen of England's 75th birthday party. It was a party at the palace and there was every rock star in the world. I got to do a little thing with Paul McCartney and Rod Stewart and people like that. That's pretty cool. I've gotten to do a few things like that, like commencement speeches at Oxford University. I met the Clintons when they were inaugurated. Those are always cool things. I don't think you're average frog gets to do that sort of stuff. I don't want to go down too much of a tabloid route, but I think your fans are curious as to how things stand with you and Miss Piggy right now? Jason Segel & Walter The Muppet: "It's Time To Rock It Again"
Jason Segel and Walter, the newest "Muppet," talk about bringing "The Muppets" back to the big screen. Also, the duo laughs about the height challenges during filming. Plus, they talk about why they used puppetry instead of CGI in the movie. I don't want to go down a tabloid route either! It's fine at the moment: we're in two separate rooms. It's kind of an hour-by-hour process. You kind of have to put the meter on it and see where the needle goes every couple of hours. I mean, at the end of the day, and I mean no disrespect, she's a sow and she's a pig. Pigs can be a little temperamental – a little hard to predict. Well, I never kiss and tell: I might kiss; I wouldn't tell. I try to keep in mind that Piggy and I have been together for a long time. Our relationship has its ups and downs, but a little harmless flirting is okay. You might not want to tell her I said that – or maybe you DO want to tell her. But there was that little moment with Reese Witherspoon. I met Rashida Jones on this movie – we had a little spark. Amy Adams was already married with a child, and I didn't want to go there. I'm not Justin Bieber. You've been on "Saturday Night Live," you’ve hosted "The Tonight Show," you’ve had hit records and huge movies. What's left for Kermit the Frog? I think that I've kind of done it all. I sort of like the idea that even after all these years I can still have fun and make people laugh and tell jokes and be silly and dance and do stuff like that. I like to think that we might actually, somewhere underneath it all, inspire people to be the best part of themselves. That would be good. And yet you've stayed a very humble frog. How have you kept your flippers on the ground? When you're as close to the ground as I am it's important. You don't want to get too high and mighty. My best advice for everyone is don't believe your own PR. I think that's very important. Jim Henson was the man who helped you all get your start. Can you tell me your thoughts and feelings about him at this point? Well, we miss him a lot. But I have to say that he sort of lifted me to new heights. That's sort of a pun, but it's true. I hope that we do him justice. "The Muppets" opens in theaters everywhere Nov. 23.